Since the first official Davidoff cigar debuted in 1968, through the brand's transition from Cuba to the Dominican Republic in 1990, the company had remained consistent in its preference towards light, nuanced, refined smoking characteristics. But in 2001, Davidoff acknowledged the changing of times with the brand's first dark and full-bodied blend to be added to the core "White Label" lineup. Davidoff Millennium embraces the tastes of the modern enthusiast, showcasing aged Dominican tobaccos (including a higher percentage of the Piloto varietal) to accentuate bold and robust characteristics. The Dominican fillers are paired with a Dominican San Vicente binder and finalized with a dark Ecuadorian wrapper. While many may refer to the Millennium as "maduro," the company refrains from using this language. This is because the term often implies that the leaves are treated differently or even unnaturally; when in fact they are simply grown under different conditions (soil, sunlight exposure, priming, etc.) and fermented until the leaves are fully mature—as with all other Davidoff wrapper leaves. 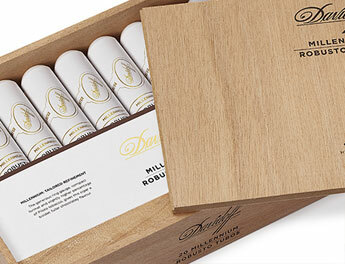 The end result is a profile unlike nearly any in the vast portfolio of Davidoff cigars. Enthusiasts can expect a medium to full body and bold flavors of chocolate, oak, malt, roasted coffee, caramel, and zesty cabinet spices as a counterbalance.